Texas Is the Latest Contender for Indoor Skiing in the U.S.
Grand Prairie, TX – Developers have proposed a $400 million indoor ski area and associated hotel, retail and entertainment facilities for Grand Prairie, just west of Dallas. The Grand Alps project is the latest of several attempts to construct such a facility in North America, although indoor ski slopes are relatively common across parts of Europe and the Middle East. Stalled or abandoned projects to build “snow domes” in North America exist in Las Vegas, Florida, Ontario and Connecticut, although American Dream Meadowlands in East Rutherford, N.J., remains under construction following a refinancing, loan default, sale and state bailout. It is currently targeted to open in late 2016. Failed attempts to launch indoor skiing have even been tried as nearby as Grapevine and Fort Worth, Tex. However, Sherman Thurston, co-chairman of developer Grand Alps Resort DFW Inc., has worked to develop similar projects around the world, including the successful snow dome in Dubai, and he holds patents for making snow indoors. 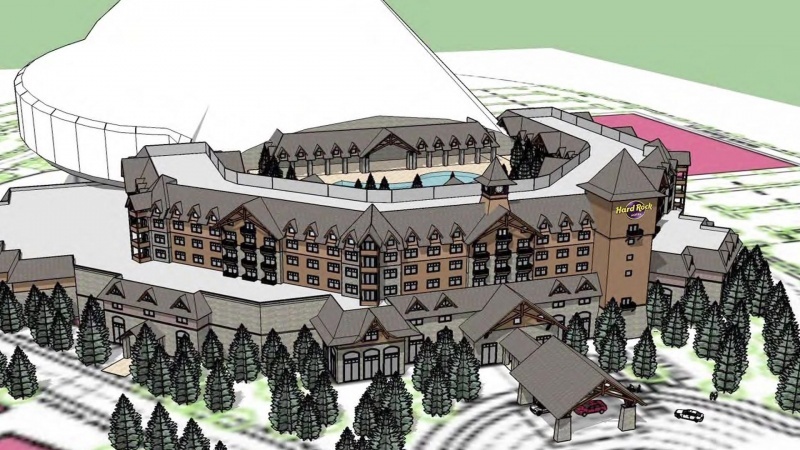 The Grand Alps project, to be built on a 58-acre site north of I-30 and Belt Line Rd., calls for the state’s first Hard Rock Hotel, multiple restaurants, a family entertainment center, a digital cineplex and specialty shops to accompany the 350,000 square foot indoor skiing facility. The plans were announced last month by officials with the city of Grand Prairie, Hard Rock Hotels and a development team backed in part by foreign investors through the same EB-5 Immigrant Investor Program that helped finance development and expansion at Jay Peak Resort and Mount Snow in Vermont, Ragged Mountain in New Hampshire and Saddleback Maine. Developers claim to already have 80 percent of the required financing in place. The design of the snow dome itself, to be maintained at 28ºF at all times, calls for seven different downhill slopes up to 1,200 feet in length, including beginner runs with slope angles ranging from 6º to 10º, intermediate slopes from 10º to 12.5º, and even expert runs and glades from 12.5º to 28º. Also included in the design is a full terrain park with a competition halfpipe, rails, kickers, jumps and more. The facility would have a vertical drop of nearly 300 feet. The city of Grand Prairie plans to invest up to $30 million in the project for land acquisition, infrastructure improvements and tax breaks including 100% real estate tax abatement for seven years, and a 75% rebate of hotel motel tax for 10 years after opening. Developers indicate that the $215 million first phase of the project, which would include the ski slopes, 300-room hotel and movie theater, could open as early as December 2017. They anticipate ground breaking in first quarter 2015, contingent upon acquiring full financing for the endeavor.